TrustDALE Review: Georgia Pack & Load Moving and Storage, INC.
Georgia Pack and Load has been in the business of offering professional and experienced moving service for over 15 years. From local moves to cross-country, they are willing to help you out. They are licensed members of the Department of Motor Vehicle Safety, Federal Motor Carrier Safety Administration, American Moving and Storage Association and the Georgia Mover’s Association. A second-to-none insurance plan is also available with your moving service. There are a handful of superior moving companies in Georgia and then there are all the rest. Georgia Pack & Load is among the very best. TrustDale's investigation finds Georgia Pack & Load keeps its prices down by keeping its overhead low. TrustDale has also found companies that hire and retain excellent employees are the companies that deliver the very best value. Why? Better movers mean fewer claims; and fewer claims mean more profit and better insurance rates. Georgia Pack & Load is smart enough to pass these savings on to you. Better movers also mean more efficient movers that take less time. Your Georgia Pack & Load experience begins with your call or e-mail. Professional, courteous office staff will respond to your inquiry to do everything in their power to satisfy your needs. 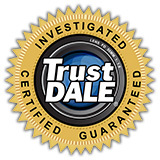 However, the TrustDale investigation has found a moving company is only as good as the movers that are moving you. Georgia Pack & Load employs trained professional movers who know how to wrap and properly move your furniture and most precious possessions. This quality is backed up by a quality control manager who shows up on job sites and keeps a vigilant watch on customer standards. According to Georgia Pack & Load President Ralph Herrin, "My Grandfather and Father owned a furniture business and I was trained that the customer is always right. Our approach is if there is a problem, we make it right." TrustDale is confident that Georgia Pack & Load stands behind its service and customer care.